We are at the brink of the fourth industrial revolution, and this one will take place online. The global retail ecommerce sales are estimated to reach an incredible $4.5 trillion by 2021 and, the vast majority of the 1.1. billion digital buyers responsible for this shift are those from the developing countries. Are the developing nations the new gold mines of the digital age? Bringing together the global e-biz community to discuss the future of e-com in developing nations and what it takes to unlock these countries’ untapped potential, UN’s trade and development agency UNCTAD hosted the 2018 edition of its UN E-commerce Week. Among the prestigious line-up of speakers was the Sri Lankan e-com heavyweight Dulith Herath – the founder of Kapruka and Grasshoppers. Herath’s talk pointed out that increased access to and activity on social networks and consistent improvements in terms of mobile internet access are fostering greater opportunities in electronic commerce operations in developing nations like Sri Lanka. But, what really revolutionised the game is the innovation in delivery possibilities. “Last mile delivery in LDCs (Least developed countries) is often a problem that large couriers or post offices can’t handle. I co-founded grasshoppers to specifically address this. Cash on delivery being the no#1 preferred payment option on LDC e-commerce it’s often neglected to be improve by couriers. I strongly advise and thrive to improve last mile delivery in LDCs as it’s a key we need to unlock e-commerce potential in these countries,” Herath explained, bringing the attention to the game changing moves that helped him drive the highly successful ‘Grasshoppers’ venture to revolutionise how Sri Lankans handled door-to-door delivery from online shopping and even selling. Grasshoppers Ltd. is a successful homegrown brand that managed to evolve into a leader in the local logistics services sector within a short span of time. Grasshoppers specialises in online shopping related deliveries, and was founded on the principles of the sharing economy amalgamated with the clever use of digital technology. Its co-founders Dulith Herath (the innovator behind Sri Lanka’s pioneering e-commerce player Kapruka.com) and Dr. Harsha Liyanage (creator of Sarvodaya Fusion promoting IT Education across Sri Lanka), were looking to establish a business that leverages on the obvious need for a local end-to-end delivery handler that works seamlessly with online buying platforms, and in the process, plays a pivotal role in democratising e-commerce in Sri Lanka. Grasshoppers allows Sri Lankans to shop on e-online from retailers abroad and when the order arrives, Grasshoppers will handle the last mile delivery, which is what used discourage most traditional shoppers from going e-commerce. The fact that Grasshoppers allows Lankans to sell products on global websites by taking on the handling of complexities in export logistics makes it a major catalyst for small and medium retailers as well. Grasshoppers went on to earn the support of the renowned Aavishkaar Frontier Fund and was handpicked by UN’s E-commerce Week as an exemplary startup. Grasshoppers’ unique standing as a turnkey solutions provider for last mile delivery in a developing country, its methods and practices were recognised as unusual and uniquely suited to emerging markets like those in South Asia. 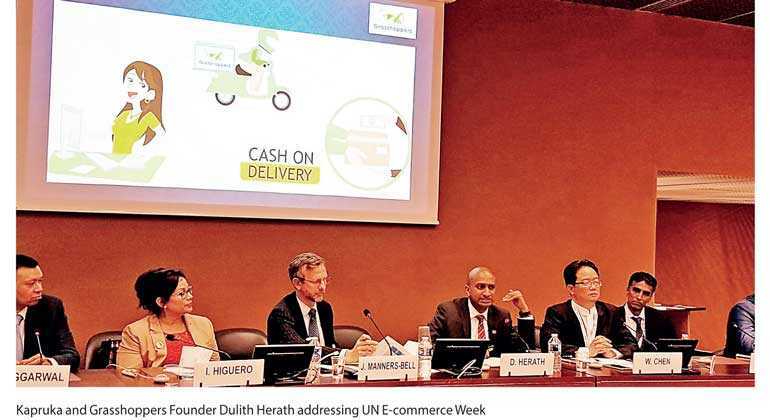 While speaking to the audience at UNCTAD’s e-commerce week, Herath stressed that when developing countries do get on board the digital revolution, it is important that the right people benefit from the change, which he attempts to do with Grasshoppers as an operation that benefits people from a wide spectrum of economic and social brackets. The potential value of ecommerce for developing countries like Sri Lanka is undeniable – not only can it drive GDP growth but it can support the creation of a new economy, new jobs and enable consistent access to goods and services, and even markets across the globe. With operations like Grasshoppers leading the way, Sri Lanka seems to be on the right track to make the most of the fourth industrial revolution online.